Pioneers in the industry, we offer lightning strike counter, level 4 lightning protection system, ese lightning terminal, level 1 lightning protection system, nfc 17-102:2011 lightning protectors and lightning digital recorder from India. Our team of experienced professionals are engaged in offering Lightning Strike Counter. Developed with first-class raw-material, these products are widely appreciated for their superior quality. These products are designed by a team of experienced professionals along with latest machinery and equipment. These products are further quality-tested before delivery for the safety of our valued clients. • AENOR is the Spanish Association for Standardization. • Certified endurance to extreme environmental conditions (Salt mist and humid sulphurous atmosphere tests). • Certified withstood current 100kA (10/350ps). • Certified advance time AT (Annex C, UNE 21186:2011). • Tests made in official and independent laboratories. • Complies with the second edition of the standard NF C 17-102, UNE 21186 and NP 4426. 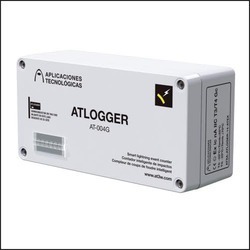 • Product certified by AENOR. • Witstand current certificate for 20 impacts of 1C04, (10/350 ps). • Insulation superior to 95% under rain. • Air terminal testable in the factory and in field; also remotely, up to 60m. (DAT CONTROLER° PLUS REMOTE). Direct application of 20 current impulses (10/350ps) with a peak current higher than 1001, and specific energy over 2,5 MNO. Tests according to IEC 60060-1 and IEC 61083-1. • Insulation superior to 95%, according to IEC 60060-1. • Range up to 60m. • Communication by radiofrequency (RF). • Fully autonomous system thanks to solar panels. • Endurance to extreme environmental conditions (Salt mist and humid sulphurous atmosphere tests). Our organization holds specialization in manufacturing, supplying, and trading a qualitative range of NFC 17-102:2011. All these lightning arrestors are manufactured using quality-assured raw material employing latest techniques and high-tech machines. To ensure the flawlessness of our product, these arrestors are stringently examined by the quality examiners before the final delivery. We offer these arrestors to our clients in various shapes and sizes as per the clients requirement. 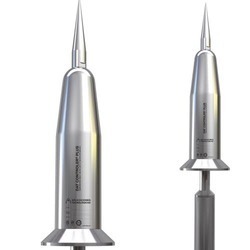 • Thunderstorms detector by measuring the electric field. • Fully electronic, without mobile parts. • Local detection of all phases of a thunderstorm. • Gives a time range of several tens of minites. • No need of a particular maintenance. • Configurable detection thresholds using a touchscreen. • Electronic module with four relay-type outputs to be connected to visual or audible alarms, UPS, auxiliary generators etc. • Data storing and access to the system on line via Internet. DAT CONTROLER PLUS i s an Early Streamer Emission (ESE0 air terminal , which operation is based on the elecrical characteristics of lightning formation. the air terminal triggers the continuous upward leader earlier than any other object within its protection area. this feature is called in the standars "advance time" or "efficency" of an ESE air terminal (T) and determinates its protection radius. the erlier the upward leader triggers, the larger is the distance where the downward leader is intercepted, thus protecing a wider area against lightning. Our organization holds specialization in manufacturing, supplying, and trading a qualitative range of NIMBUS Lightning Protection System. All these lightning arrestors are manufactured using quality-assured raw material employing latest techniques and high-tech machines. To ensure the flawlessness of our product, these arrestors are stringently examined by the quality examiners before the final delivery. We offer these arrestors to our clients in various shapes and sizes as per the clients requirement. Our organization holds specialization in manufacturing, supplying, and trading a qualitative range of Tercel Lightning Protection System. 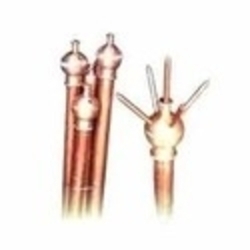 All these lightning arrestors are manufactured using quality-assured raw material employing latest techniques and high-tech machines. To ensure the flawlessness of our product, these arrestors are stringently examined by the quality examiners before the final delivery. We offer these arrestors to our clients in various shapes and sizes as per the clients requirement. Our organization holds specialization in manufacturing, supplying, and trading a qualitative range of INDELEC Lightning Protection System. All these lightning arrestors are manufactured using quality-assured raw material employing latest techniques and high-tech machines. To ensure the flawlessness of our product, these arrestors are stringently examined by the quality examiners before the final delivery. We offer these arrestors to our clients in various shapes and sizes as per the clients requirement.